Acoustic panels There are 5 products. 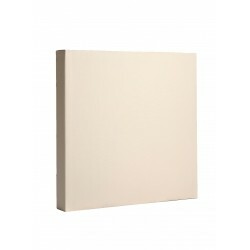 Sound absorbing panels are very important for acoustic treatment and acoustic insulation. 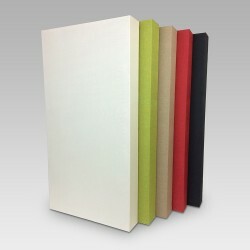 There are various types of absorbent panels, those made of acoustic foam such as polyurethane memory foam which are less pleasing aesthetically and less effective, and those made of glass wool or rock wool interposed in a wooden frame. These last panels offer better absorption, do not wreck over time and absorb frequencies without excessively killing high frequencies, providing a more balanced room frequency response. We recommend buying our 10cm thick panels so that they can also act on the lower frequencies. If in doubt, please do not hesitate to contact us. 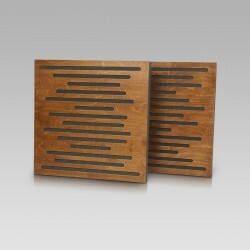 A decorative acoustic panel designed to absorb reverb in a recording studio, which is a shooting room or a director. Light construction allows easy mounting on the wall or ceiling. Damping material inside the panel ensures the acoustic absorption of class A.
Broadband acoustic absorber designed to correct acoustics of recording studios, home and project studios, theaters and professional audio parlors. Ensures effective sound absorption across the range of audio spectrum. Hybrid acoustic panel that combines sound absorption and dissipation. Made of birch wood ensures the dispersion of medium frequencies. The remainder of the acoustic wave energy is absorbed by the excellent absorption of sound absorbing acoustic foam. 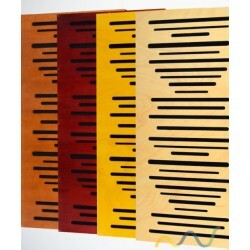 PikFuser WOOD 10 CM– 100 cm x 50 cm x 10 cm( 39,37×19,61×3,94 inch ) PikFuser WOOD – Designed to improve the acoustics of each room. Eliminates too long echo, standing waves or echo flapping in the medium and high tonal frequency. 4 colors available. If within 24 hours from the order a specific color is not requested, we will send the natural wood color.